We are excited to announce a new professional development opportunity for artists in the Interior region of BC. We are now accepting applications to participate in the Arts Integration Learning Lab, taking place in Kamloops, BC from November 3 to 7, 2014. ArtStarts in Schools presents the Arts Integration Learning Lab, a subsidized five-day learning experience for professional artists designed to position them to work with schools in their region. Professional artists from all disciplines—visual arts, theatre, music, dance, storytelling, interdisciplinary and more—are invited to apply. 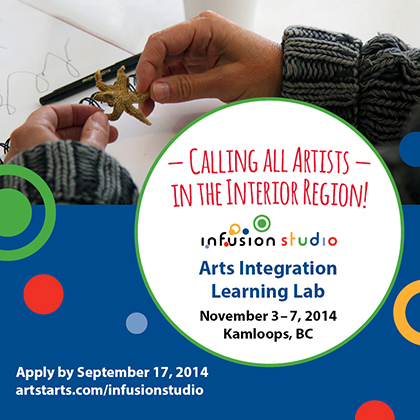 Up to 15 professional artists from across the Interior will be selected through an application process to participate in the Arts Integration Learning Lab in Kamloops from November 3 – 7, 2014. Led by a series of facilitators and specials guests, participants will unpack the definition of arts integration and explore practical ways to effectively work with young people and educators to lead arts infused classroom experiences. 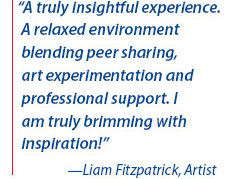 Connect with other artists in BC’s Interior and engage in peer learning and reflection. Enjoy breakfast and lunch each day. In addition, participants living outside Kamloops are eligible for subsidized travel and/or accommodation expenses. The Arts Integration Learning Lab is an initiative of Infusion Studio, presented by ArtStarts in Schools, a not-for-profit organization that provides innovative arts programs for young people, practical resources for teachers and artists, and leadership in advocacy for arts in education. This opportunity was made possible through funding support from BC Arts Council and the Government of British Columbia's Creative Futures program. The deadline to apply is September 17, 2014. Applicants must be residents of the Interior. Questions? Contact Terri Anne Wilson, Arts Integration Manager by email at terrianne@artstarts.com or by phone at 604-336-0626 ext 106. Arts Integration is an approach to teaching in which students construct and demonstrate understanding through an art form and engage in a creative process which connects an art form and another subject area and meets evolving objectives in both.